At Print Concierge, we always provide our customers with as many choices as possible when it comes to printing coasters. This is because we want to ensure we are helping you in making the right purchasing decision. Drink coasters are a great promotional product as their design can be customised to convey a certain message or provide a unique product offering. They are an essential piece of marketing collateral for bars, restaurants, golf clubs, RSL clubs and bowling clubs. We provide 2 coaster board options to choose from. Our customers can select from a 360gsm or a more premium 410gsm board, therefore more choice! You can also choose from two of our 95mm standard coaster shapes (square or round) at no extra charge. Some printing companies will charge you more for printing round coaster vs square. 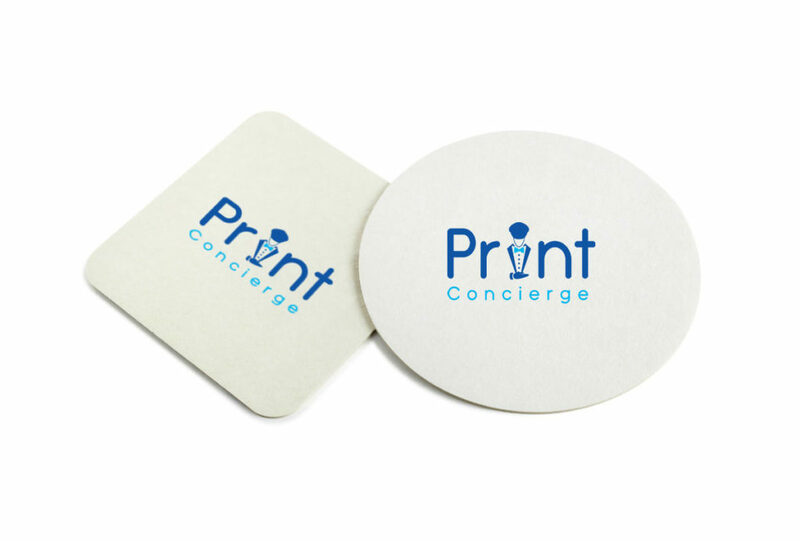 Print Concierge can also print and trim custom sizes and shapes on coasters that have a unique design. A simple die-cut will do the trick! Let us know if you have a custom size because we may already have an existing knife we can use, so you don’t have to pay for any additional set up. All coasters can be printed in full colour or specific pantone colours if requested. We understand the important of colour sensitivity projects so we will work with you to achieve your outcome.